It was the February 29th, 1996 and I was getting closer to the delivery of my first born. At about 10:30pm, the nurse and the anesthesiologist came into the room to see if I was ready for my epidural. About an hour earlier, the nurse had given me pitocin to increase the contractions as they were irregular. My baby must have been comfortable because he was slow in getting here. The nurse said that it had been too many hours from the point of my water breaking and now we were getting to the point it could be dangerous. Once she gave me the pitocin, my labor pains became more intense and much closer together. It was shortly after that, I had the epidural which relieved the pain. Around midnight, I remember lying there comfortably. All was quiet and content in my room, but in the distance I could hear the a woman, screaming at the top of her lungs. The nurse came in to check on me and I asked her what was going on. She replied, "Sweetie, some ladies want to heroes." Apparently that mom-to-be had opted out of the epidural and chose to endure the labor and delivery process. This week, we began the labor and delivery process of the Israelites. Joseph's influence in Egypt had begun to subside. About 400 years after the Israelites settled in Goshen, they found themselves with a new king who did not know Joseph and had become a people greater in number than the Egyptians (Exodus 1:8 & 9). The scripture goes on to say that the Egyptians oppressed them with forced labor and made them work ruthlessly and that they made their lives bitter with hard labor making brick and mortar and working the fields (Exodus 1:11-14). The people began to cry out to God to deliver them from their pain. God hears them and sends them one of their own, Moses. When God came to Moses, he was in Midian country. Maybe like me, he wanted to avoid the pain that he might experience because he heard the cry of his people, like I heard the the woman down the hall. He argued a bit with God trying to pass on the "hard labor" he might face when confronting Pharaoh about the release of his people. As always, God's plan prevailed and Moses was off to Egypt. In Chapter 5 of Exodus, we begin the early stages of contractions. The Israelites were already experiencing, what I might call "Braxton Hicks". They are contractions that don't hurt too bad that happen weeks before actual labor takes place. It it the process of preparing the body for the day of delivery. The Israelites were suffering under the rule of new Pharaoh, but they didn't know what labor was until Moses requested their release. Verses 6 through 9 it says, " That same day Pharaoh gave this order to the slave drivers and overseers in charge of the people: 7 “You are no longer to supply the people with straw for making bricks; let them go and gather their own straw. 8 But require them to make the same number of bricks as before; don’t reduce the quota. They are lazy; that is why they are crying out, ‘Let us go and sacrifice to our God.’ 9 Make the work harder for the people so that they keep working and pay no attention to lies.'" Moses' request was like giving the Israelites pitocin. Their labor became "hard labor." We begin to see the contractions become more intense for the Israelites. We all know that the contractions must be stronger and closer together before delivery can happen. I believe this was the first stage of hard labor for the Israelites. God had already promised them 400 years earlier that He would deliver them (Genesis 50:24). Little did they know they would have to go through the whole labor process before they could be delivered. Labor in a spiritual sense is never easy. Over my life as a follower of Jesus, I have discovered there isn't a "spiritual epidural" that can be administered when life labor pains intensify. Oh how I wish there was because there are times in my life that the pain is unbearable. As we push through the process not only is glory to be birthed, but the hope we need to believe is being produced. Romans 5:1-5 says this, "Therefore, having been justified by faith, we have peace with God through our Lord Jesus Christ, 2 through whom also we have access by faith into this grace in which we stand, and rejoice in hope of the glory of God. 3 And not only that, but we also glory in tribulations, knowing that tribulation produces perseverance; 4 and perseverance, character; and character, hope. 5 Now hope does not disappoint, because the love of God has been poured out in our hearts by the Holy Spirit who was given to us." It is through Jesus' suffering, or should I say, his labor pains, that deliver us from sin to receive salvation. Romans 8:17 says we will share in his sufferings and in order that we may share in his glory. Jesus is like the the mom-to-be that I heard that night I was about to give birth, he chose not to opt out of the painful process, but to be a hero and deliver us. 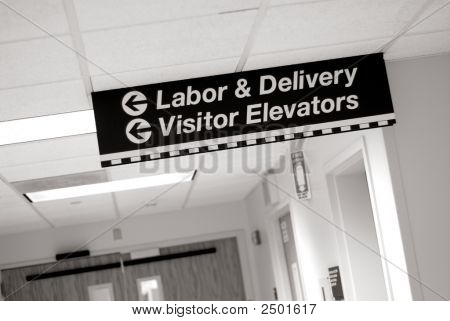 As with the women in those days and throughout generations, labor and delivery is never experienced alone. A midwife was used to help the coach the woman through the birthing process, much like midwives, nurses, birthing coaches and husbands coach women today. I believe the Holy Spirit is our "husband" to encourage and coach us during our labor and delivery. Maybe you have found yourself in in a season of "hard labor." Personally, this has been a season in my own life that I have been experiencing labor pains and they seem to be getting more intense and closer together. In child birth, the actual time of delivery is unknown, unless one has a "scheduled" C-section. Like the "spiritual epidural", there is no "spiritual C-section" in our delivery process. We have to p.u.s.h. (pray until something happens) until we have been delivered. With these words, let me encourage you as well as encourage myself, don't give up! Or in another word, do not abort what God is about to birth in your life. The delivery of God's promise will outweigh the pain of labor and the joy that will follow will be more glorious than you can imagine.